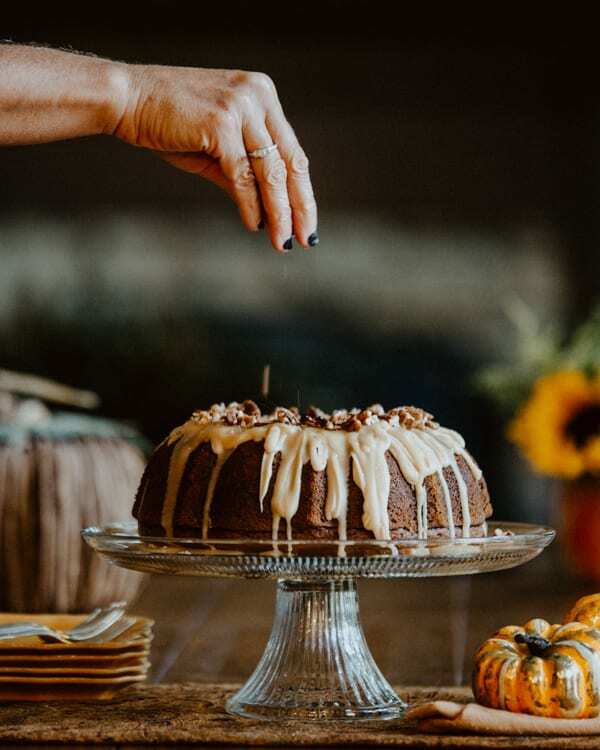 Pumpkin Spice Bundt Cake with Brown Sugar Glaze is a guest post by contributing author, Andrea Ferenchik. 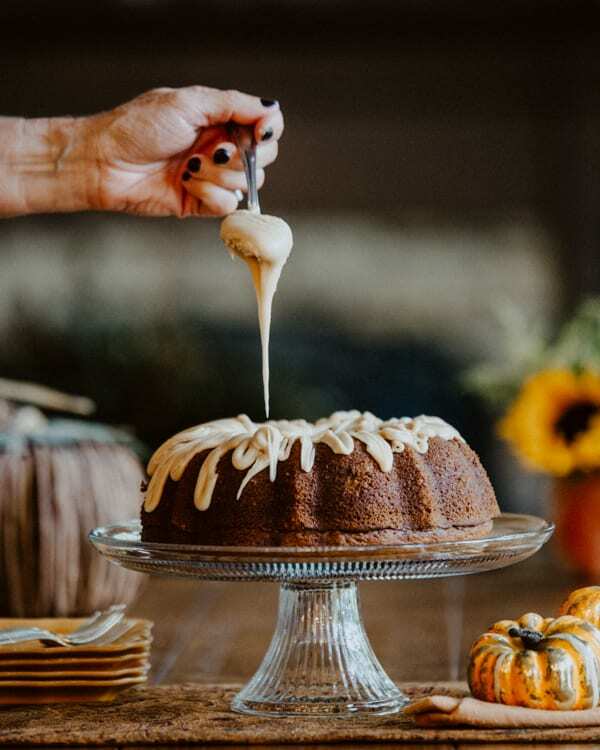 She’s sharing her Aunt Marie’s favorite pumpkin cake recipe today. Growing up, food and baking were always a big part of our family gatherings. Nothing gourmet, just tasty family recipes that never disappointed (except for maybe fruitcake.) 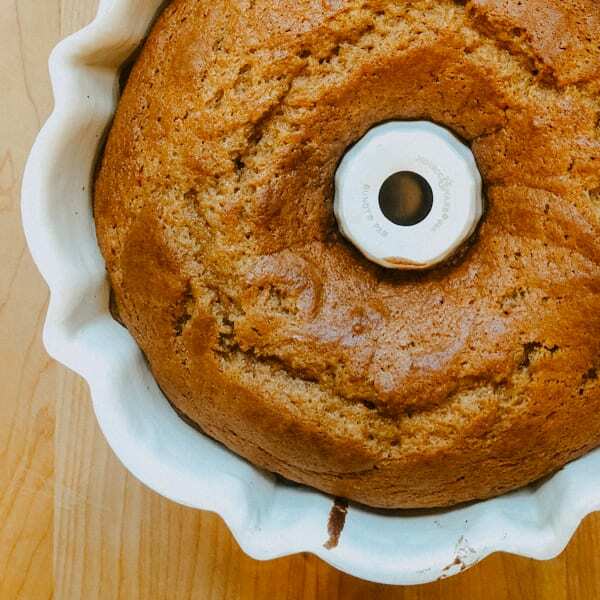 My Aunt Marie makes a simple, but delicious Pumpkin Spice Bundt Cake. In honor of Fall, I thought I’d make it and share it with you. For the sake of the photos, I decided to add a glaze to it but Aunt Marie enjoys it plain. She says it keeps well and is always moist. Aunt Marie drove with her granddaughter down to college to keep her company and stopped along the way so I was lucky to be able to grab some pictures of her and I also asked if she would write out the recipe. 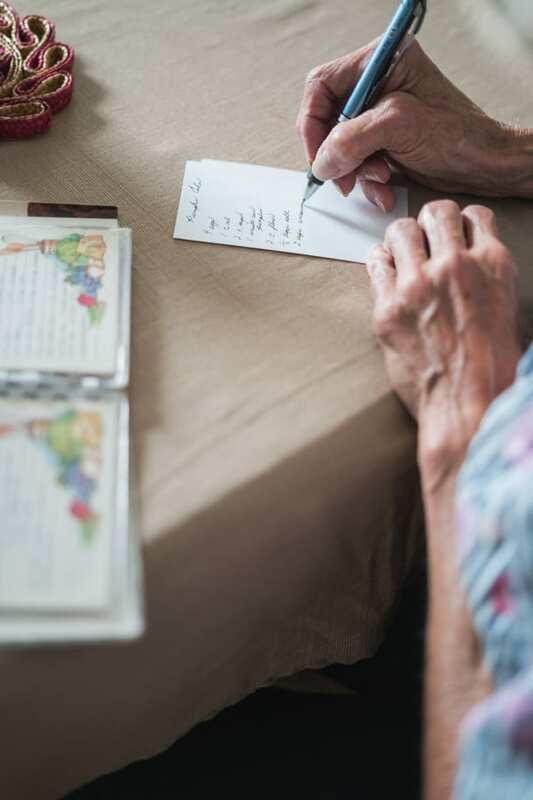 I think it’s so important to have family recipes handwritten. One day this may become a lost art with blogs and online recipes. And everything is better with nuts. Especially pecans! 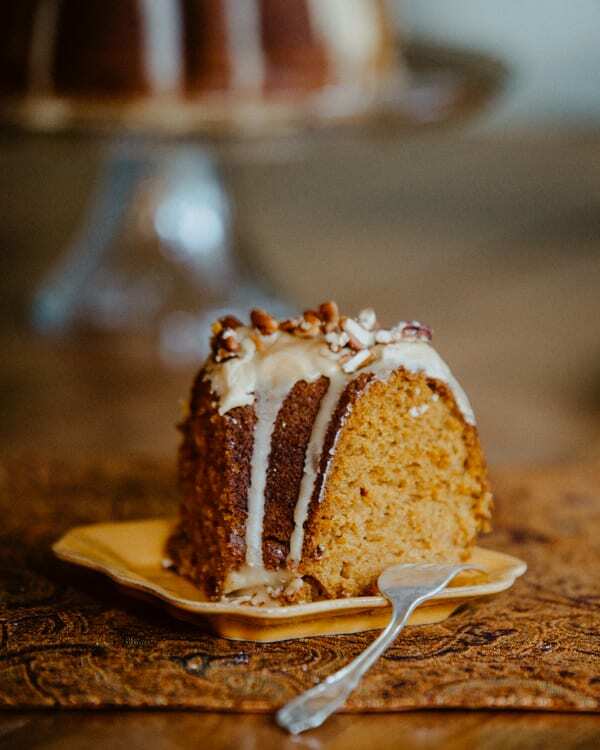 I hope you will try Aunt Marie’s Pumpkin Spice Bundt Cake with Brown Sugar Glaze. If you do make it, we would love to see a photo. Make sure to tag @momlovesbaking on Instagram. 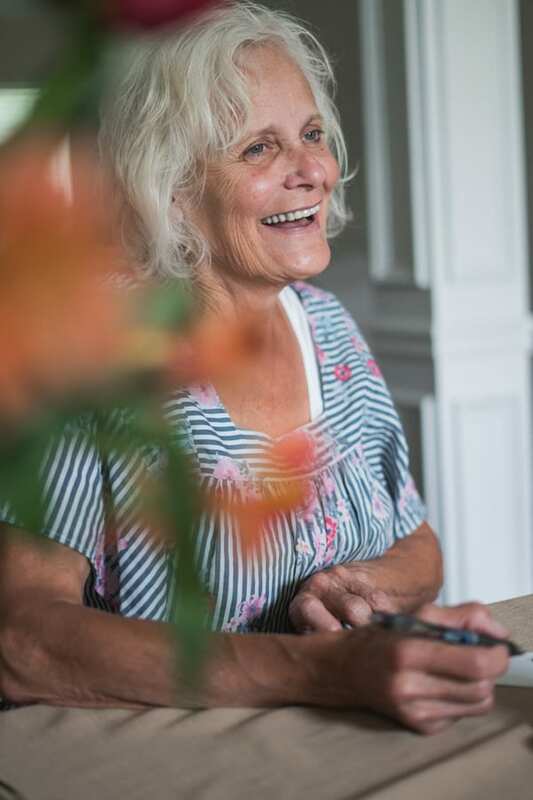 Read more about Andrea on our Meet the Team page. 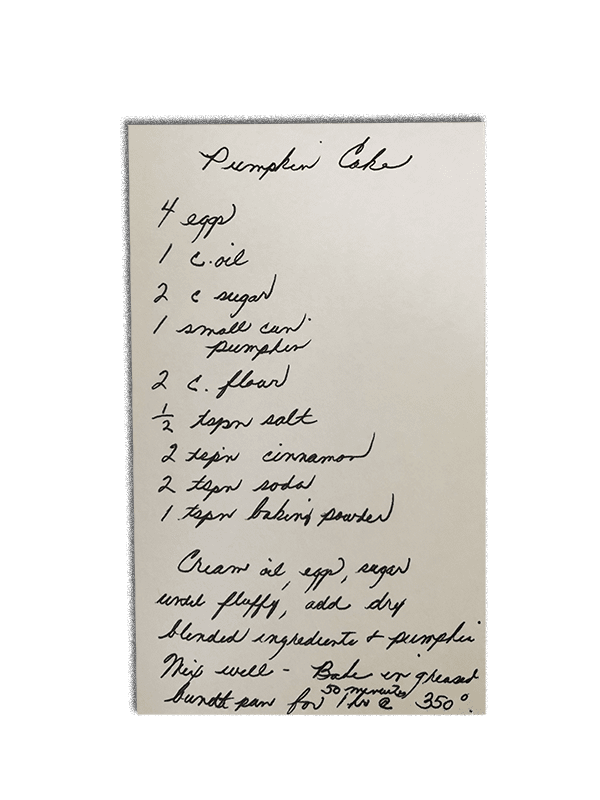 A vintage recipe Pumpkin Cake from the author's Aunt Marie, plus a delicious brown sugar glaze. Cream oil, eggs, sugar until fluffy. Add dry blended ingredients and pumpkin. Mix well. Bake in greased Bundt pan for 50 min-1 hr at 350 degrees. In small saucepan, bring brown sugar, water, butter, and corn syrup to a boil over medium-high heat. Reduce heat to medium-low; cook for 1 minute. Remove from heat. Add confectioners sugar; whisk for 1 minute. Let cool for 6 minutes before drizzling over cooled cake. Garnish with Pecans as desired. 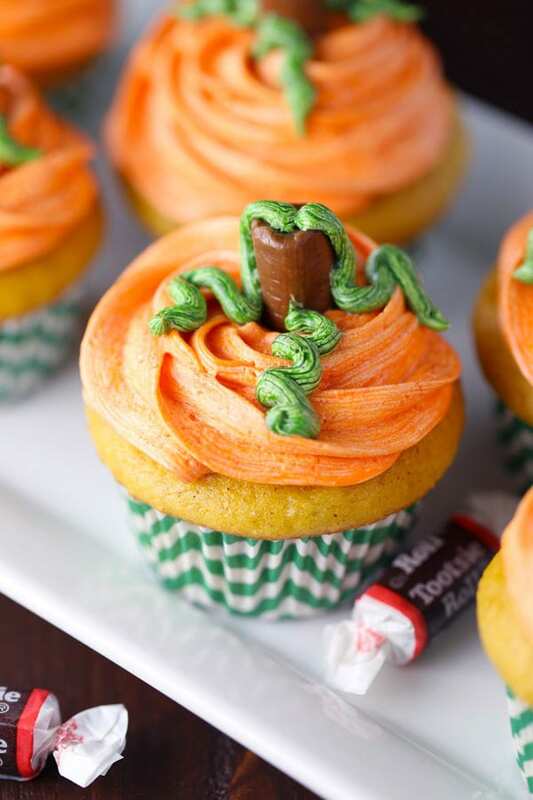 You might also like these Pumpkin Cupcakes. 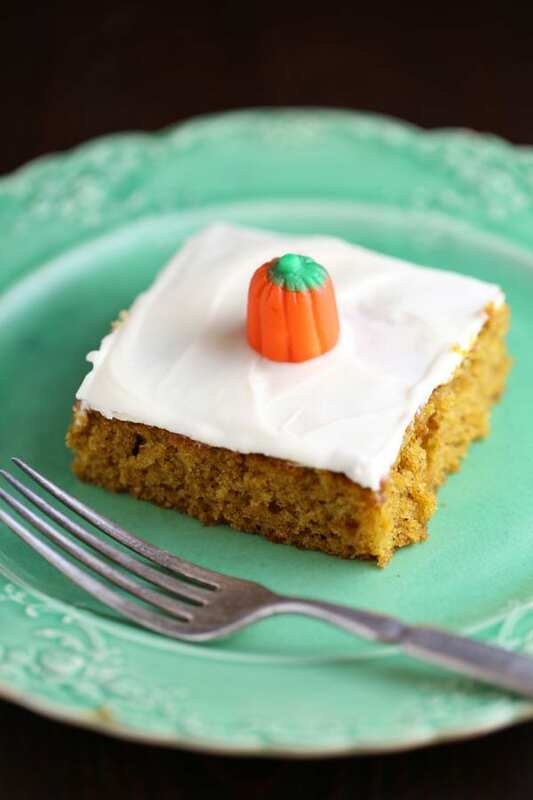 Or maybe you would like to try this classic Fall favorite: Pumpkin Bars with Cream Cheese Frosting. If you like this Pumpkin Spice Bundt Cake with Brown Sugar Glaze recipe post, please pin it on Pinterest. The image below is perfect for pinning! Simply hover your mouse over the top left hand corner of the image and the “Pinterest Save” button will show up. Click that and save this pin to Pinterest. Heirloom recipes are the best!! I think the heat recipea in the world are in people’s recipe boxes. Thanks for sharing! 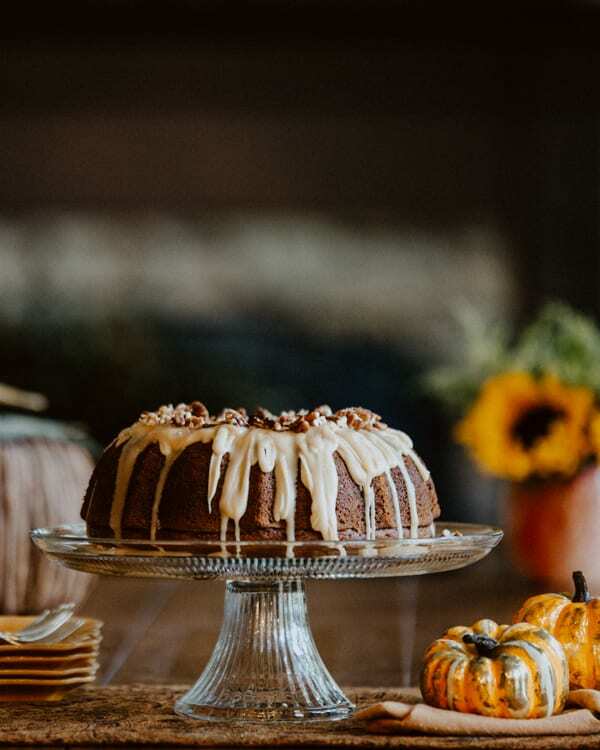 I just made your pumpkin cake, what a beautiful cake. I can’t wait to try it. Thank you for your recipe. Just made and now waiting for it to cool! Beautiful cake!!! Hi , thank you for sharing this recipe recipe, I made it for our Canadian thanksgiving to replace pumpkin pie. I will make slight d’ajustements, less sugar.
. A bit tricky for the glaze. Recipe ended up looking like real icing instead of Glaze. Thank you for your comments and hope you had a wonderful Thanksgiving! Hello from Atlanta and Thank you! I hope you enjoy it! Hello! The recipe calls for 15 ounces of pumpkin puree so that would be about 1 3/4 cups of fresh, mashed pumpkin. If you have a kitchen scale, you could weigh it. Hope that helps. Such a stellar recipe! The cake was an absolute hit with my family! A great way to use up some pumpkin puree I had. Thank you so much! That’s fantastic! So glad you enjoyed it!